Welcome to our collection of all-natural cashmere. If you're looking for luxurious cashmere jumpers or quality cashmere cardigans at a surprisingly affordable price, you're in the right place! WoolOvers offer three distinct cashmere blends, perfect for both wrapping up against the elements and looking your best at a formal occasion. 100% Pure Cashmere is our softest, most luxurious yarn fashioned into some of the finest cashmere knitwear and accessories available. For everyday luxury, Cashmere & Merino is cosy and comfortable, coming in a huge choice of colours and styles, notably our timeless cashmere ponchos and coatigans. 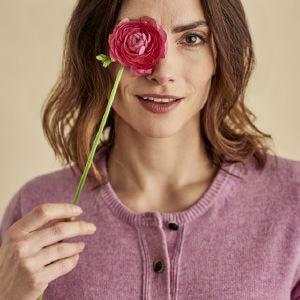 Explore this popular, eclectic range, and find some quality WoolOvers cashmere perfect for your unique style!